← Vegan MoFo, Day 3- Quick, Easy, and Delicious! Vegan MoFo. Day 4, Part 1 – Weird Food Combo! There will be a post from Mike along in a couple of hours, showcasing our weird food combination dinner. But I couldn’t pass up a chance to talk about a weird food combo that I have loved since I was 17 years old (I’m 42 now, so that’s a quarter-century… dang). Just so you know: there’s nothing healthy after the cut. 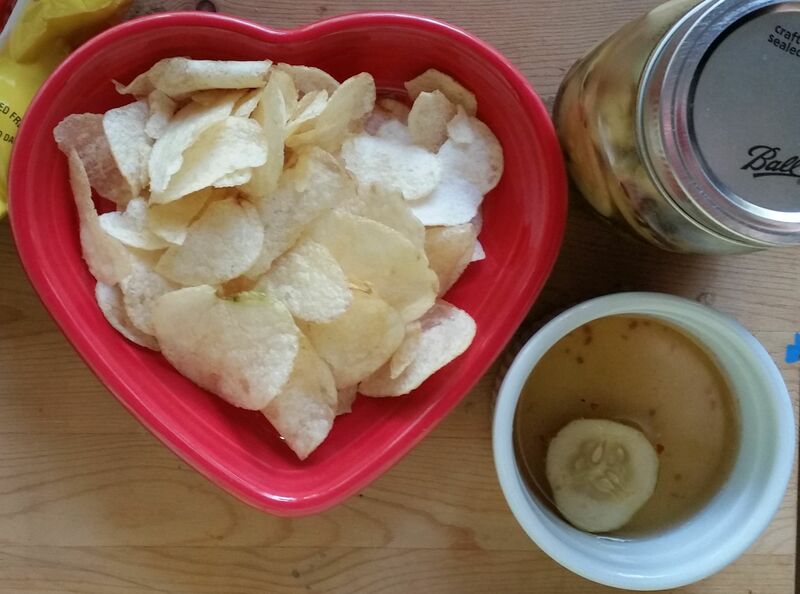 Potato chips and dill pickle juice. That’s right. Salty, sour, crunchy, garlicky, and puckery. It’s simple, it’s delicious, and it has basically no nutritionally redeeming value. I can’t remember how, exactly, I thought of this, but I distinctly remember when. It was the summer between junior and senior year; I was living in a tiny town in a tiny county in northwest Florida. I’d just moved there, so I didn’t have friends. We were poor as heck, and we didn’t have TV. I spent a lot of time reading that summer (although I’ve been a huge reader since before kindergarten, so this wasn’t particularly new). Books at breakfast, books at lunch, books by the barn, books out under the trees. I pleasure-read the sorts of books I’d’ve read in English class if I’d not gone to school in Florida – Wuthering Heights, Animal Farm, Lord of the Flies. I also read The Stand that year, and Danielle Steel books, so it wasn’t all English Lit classics. This has nothing to do with the snack, really. Growing up, my mom would sometimes put potato chips on her sandwiches, and I learned to love that, too. Potato chips on a faux tuna sandwich is still one of my favorite food combinations, along with vegan Doritos knockoffs on peanut butter & jelly. So it wasn’t too uncommon for us to have chips in the house. And I’ve always loved pickles. If I had to guess, it went like this: I made myself a sandwich, and had a pickle and a handful of potato chips on the side. The potato chips got some pickle brine on them, but I ate them anyway and found them delicious. Soon I was just pouring myself a small dish of brine, grabbing a small bowl of chips, and dipping my way to tasty happiness. 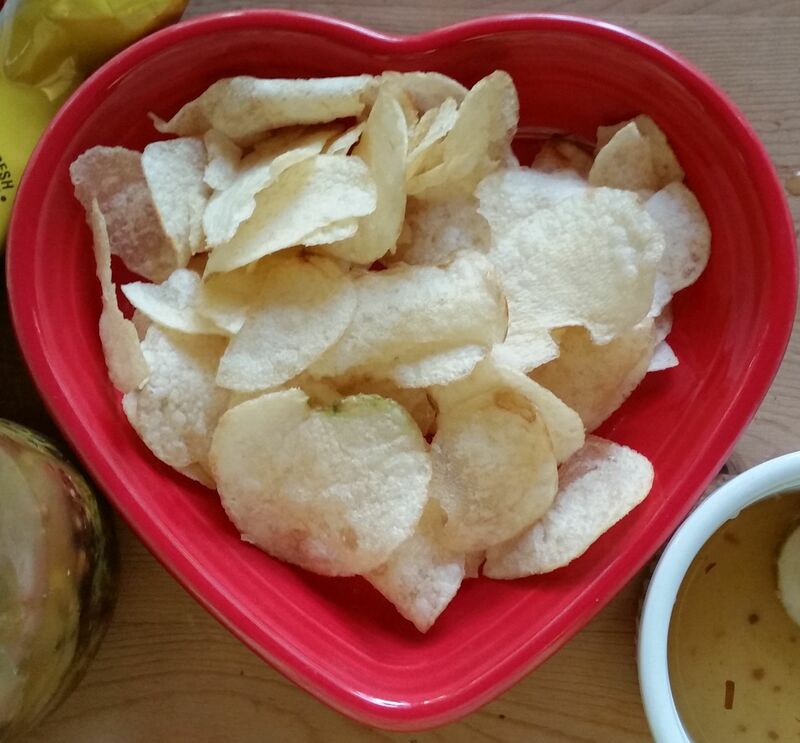 I don’t do it very often anymore – we don’t eat much in the way of chips – but I still love it. I became very particular about it, over time. 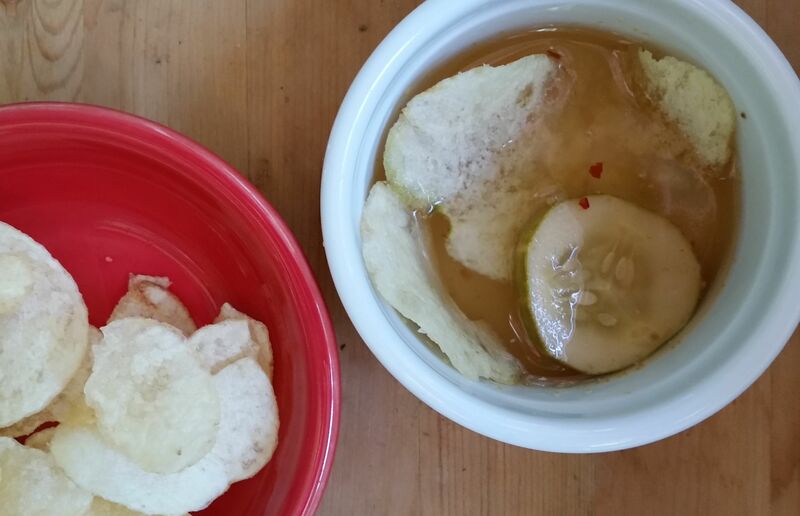 I wanted to potato chips to get a little bit soft, almost totally saturated with the pickle juice. So I’d put two or three in the dish, let them soak for 15-30 seconds, and then eat one. I replenished each chip I ate, so I had a steady supply of perfectly-textured and -soaked chips. (Everybody has their weird food behaviors, and this is one of mine.) 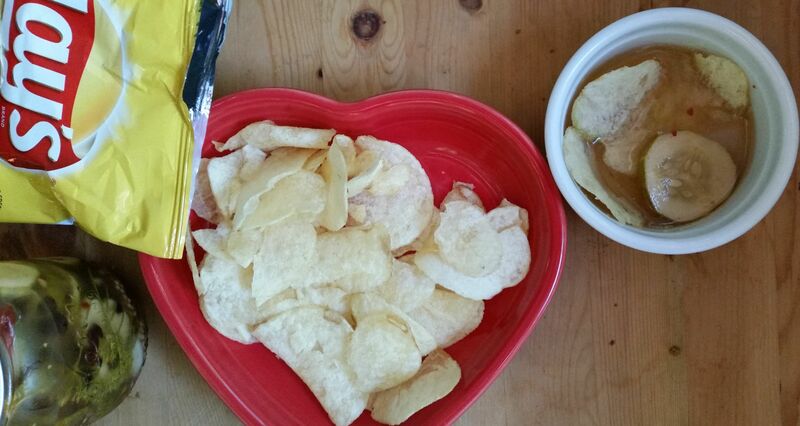 Because I like a specific texture, I prefer to do this with thin potato chips – chips like Lay’s Original are perfect. Because we shop at vegan markets and co-ops, though, I’ve often used various brands of kettle chips; they work, but they are generally too thick and crunchy for my tastes (when it comes to this snack), so I soak them a lot longer. These days, the pickle juice I use is brine from my homemade pickles. Since I started canning my own pickles last year, we haven’t bought pickles once. I use a lot of garlic, a fair bit of heat, and a good pickling spice mix in my brine, so that makes this treat a little special. It’s delicious with any brine, though! Be sure to check out Mike’s post later! Yeah, I get weirdly fussy about some food stuff! This is one of those things that I am very “I like it the way I like it!” about. Thanks! It was a Christmas gift from Mike last year and I adore it! Totally one of those things that you never knew you wanted but you’re totally in love with after you get it, and you don’t want to live without one ever again! 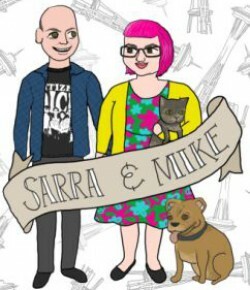 I love hearing stories about weird food behavior! Everyone has them!